RF pixel laser, based on the RF-based technology, is a minimally invasive skin barrier breakthrough treatment for skin repair and aesthetic enhancement. 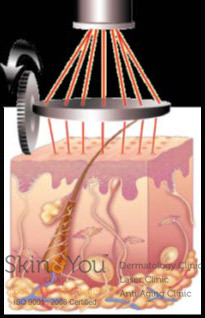 Its synergy of technologies provides patients with a quick, easy and virtually pain-free answer to stretch marks. The RF Pixel module uses micro-plasma technology to create multiple controlled micro-channels that reach beyond the stratum corneum (superficial layer of the skin), creating a local thermal (heat) injury zone, similar to the pattern created by many fractionated skin resurfacing lasers. The remaining tissue aids the healing and generation of new collagen. Eventually the irregular epidermal pigmentation is eliminated and the dermal collagen is smoothened and tightened. Depth of ablation varies with energy output and can reach up to several hundred microns, while the controlled spacing between pixels minimizes the damage on the treatment area, thereby strengthening collagen as well as reducing patient downtime. Skin & You Clinic, Mumbai, has the latest technology in stretch mark removal that can rapidly treat large areas without the limitations of older technologies. The unique RF pixel treatment is safe, has reduced downtime and minimal side effects. We specialize in stretch mark removal obtaining almost a 60- 75 % reduction following treatment.